Designed by Brazilian architect Romeu Santana all buildings are constructed with one thought - "the environment must lead..."
Keep informed of updates and announcement as we take this journey! We want you with us our dream takes shape and becomes a reality! I first went to Brazil in 1984 and although I have travelled to 56 countries around the world, no country has ever attracted me like Brazil for many reasons including its challenges, and I am now privileged to call Brazil home, although I currently still live in Cape Town where I was born and where I have a business. The Mantiqueira is a mountainous region that lies on the border of three great Brazilian states, being Rio de Janeiro, Sao Paulo and Minas Gerais. These three states (there are 28) make up 70% of all Brazil’s economic productivity. In the intersection the unique Mantiqueira Mountain Range is located and here 15 000 people live in the ‘City’ of Passa Quatro. It is an attractive vibrant country town boasting an infrastructure that is greater than its modest population suggests. Numerous bed and breakfasts of course but the town also has two substantial four-star hotels, the latest of which opened only a year ago – giving a clear insight that this is no ordinary small town location. 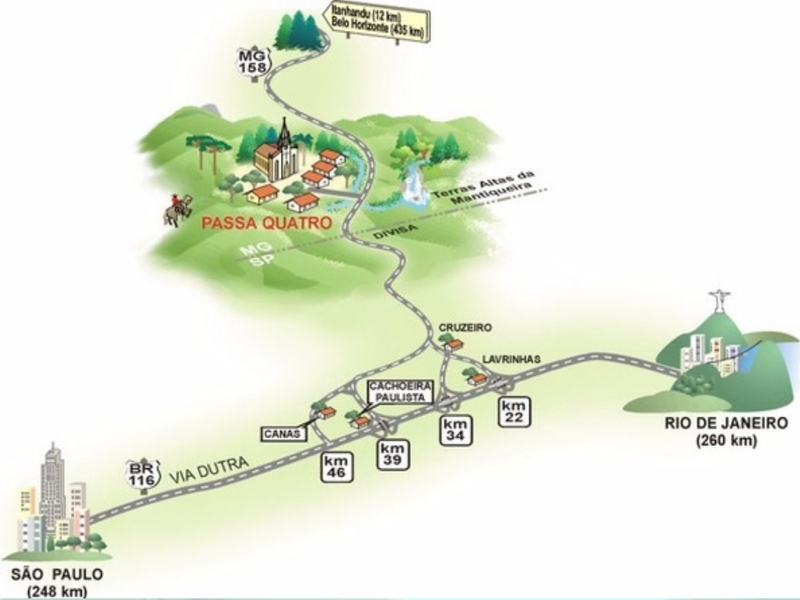 Passa Quatro is filled with proud friendly people, and the weekend sees an influx of Brazilians mostly from Rio and Sao Paulo (both are 3 hours drive) wanting to enjoy mountain walks, mountain biking, hiking and climbing. There are also many artisanal attractions in the area from coffee plantations, artisinal dairies, making, fish farms, cachaça distilleries and our very own ‘Smoking Mary’ steam train (Maria Fumaça) that takes tourists from the town centre to the historic border tunnel with Sao Paulo. Eleven years ago I bought a small farm in the area and last year my partner Romeu bought the adjacent farm. Together this is now Fazenda Sao Francisco de Assis, an animal sanctuary. We currently have 25 hectares bordering forested areas and farms in a totally enchanting and private valley. The farm has a perennial river running through it flowing straight from the mountains. The property has four access points, one house and three other building one of which is a guest cottage and is well serviced by a gravel road from the town (3km) that makes its way to the hamlet further up the mountain (Jurema). With a variety of fruits, the farm is however dedicated to its role as an animal sanctuary and this will always account for 80% of the property. The other 20% being allocated to our own housing, the future Green School and housing and the organic crops, fruit trees (including lychees, jabuticaba, citrus, avocado and coffee) and bee hives. Animals on the farm include otters, possums, jaguarundi (otter cat), armadillo, rabbits and monitor lizards. We will with the assistance and approval of Ibama (nature conservation) bring back other animals such as coatimundi and monkeys and other animals that used to be in the area and still are but not currently on the farm. The farm (and the area) has an incredible energy and for those who share a passion for minerals we have found plenty of obsidian, tektites and crystals all of which are associated strongly with energy. Seldom do I go for a walk around the farm without returning with a pocket full of stones that intrigue South African customs officials when I bring some of them to Cape Town! The soil is rich and productive and the cows on the adjoining farms are happy and I like to think they are only there for milk! The opportunity and the decision to purchase the adjoining farm crystallised the idea of opening Green School and over the last two years Romeu and I decided it was worthy of our total commitment. Green School Brazil will be a non-profit organisation and we have decided to transfer the farms to Green Think Foundation to ensure the long-term future of the entire project. In addition, substantial personal assets are being realised to invest into the Green School project to create it and sustain it. In due course, a Board of Trustees will administer the Green Think Foundation to further protect the long-term viability and vision of the project.